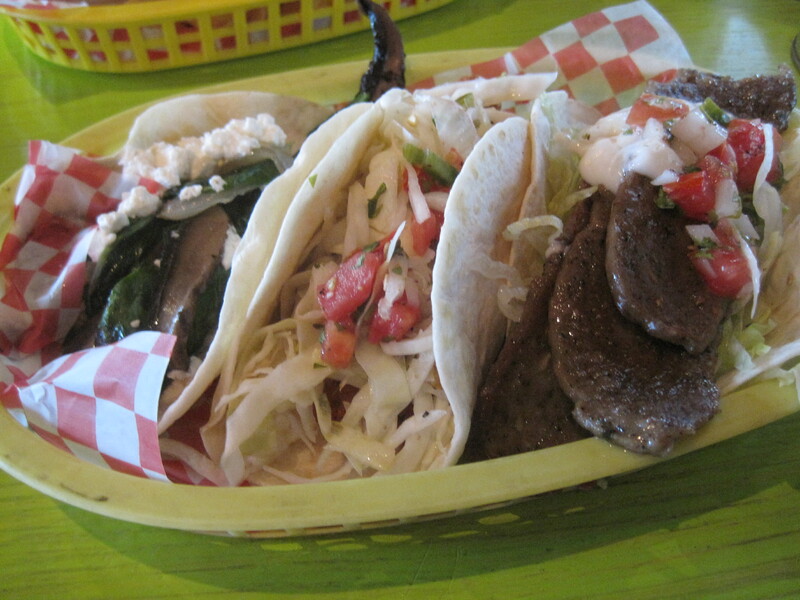 The three are a portabella, a fish and a gyro taco. All good, but the portabella? Surprisingly good. Our original review of this restaurant is here. Tastee’s Jamaican Cuisine is a small restaurant in a strip mall one block south of the Highpoint Road-Highway 124 intersection. It sits adjacent to Flame’s Sports Bar and Grill, facing 124. The day I arrived they were smoking their jerk chicken just outside the store. Inside, it’s small. There are a few tables, but very few. The menu is scrawled on a whiteboard, there are covered containers of food behind a counter, and on the counter, a heating rack full of patties. They have chicken and beef patties at this place. Patties are cheap, less than $2.00 each. They also have dinner plates, with jerk chicken, oxtail, curried chicken and goat, brown stew chicken and brown stew fish. The dinner plates come in a medium and large size, have peas and rice and vegetables as sides. Medium plates run about $7 dollars or so and large plates about $9.50 or so. I was shopping for lunch. My wife only eats patties, so I bought 4 chicken patties and a large plate of curried goat to go. As appealing as the smoked chicken was, I had never had goat and this was an opportunity. We took it home, shared tastes. My daughter had never had goat either and there wasn’t any way she was just eating patties. Goat is a dark meat, and some compare the taste to lamb or veal. The curry spices, of course, were the dominant flavors in the dish. The curry was tasty without being too spicy or overpowering. Peas and rice were good, and the mixed vegetables (largely stewed cabbage) were good as well. The patties, in comparison to Golden Krust, were larger, rounder, and the filling was creamier in texture. The patties had some spicy heat, which wasn’t immediately obvious but would creep up on you later. Verdict: good first impression, recommended for now. It is inexpensive, as patties are cheap and filling. I will need to go back sometime and try their home smoked chicken.